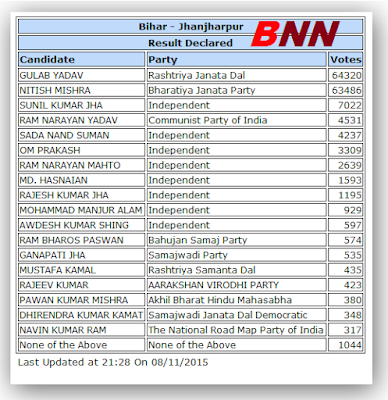 Jhanjharpur constituency is in the Madhubani district of Bihar. We take a look at Jhanjharpur Map and also the Jhanjharpur Assembly election results from 1977 to till date. The period from 1970 to 1990 belonged to JAGANNATH MISHRA and Congress Party. JAGANNATH MISHRA also became the Chief minister of Bihar. Ironically, the seat is still in the Mishra family, with his son Nitish Mishra now an MLA from here, but he is now a member of JD(U), and not Congress.